The exclusive combination of compact construction with convection heating technology delivers fast and tasty results. 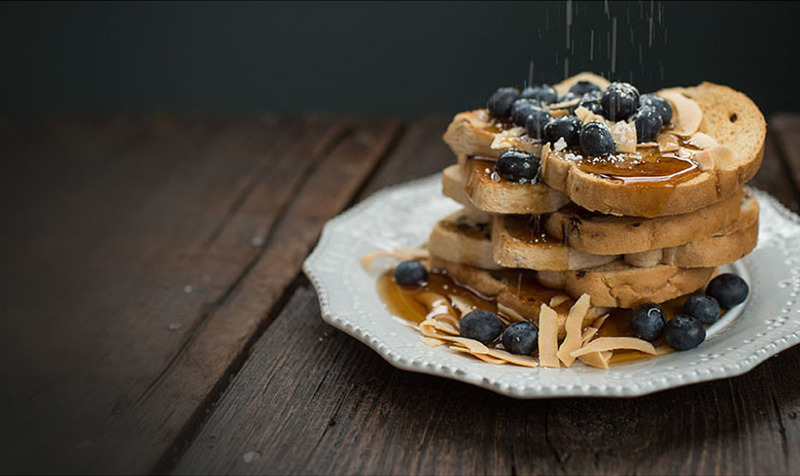 The interior of the toaster oven is designed to precisely manage airflow based on the principles of thermodynamics, naturally cooking food using the four different settings (bake, broil, toast, and keep warm). With room for four slices of bread or a 9" pizza, this toaster oven is perfect for fast cooking tasks in any size kitchen. Choose from convection bake, broil, toast, and keep warm. The precise cooking timer features a stay-on function for longer baking tasks. Keep a close watch on food while it bakes without opening the oven door. 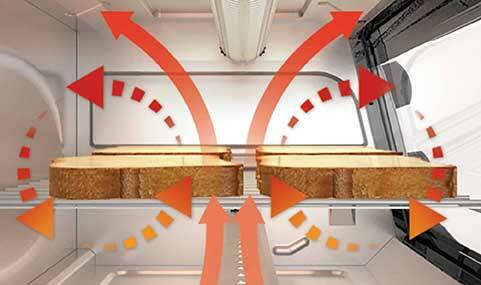 The interior is designed to circulate hot air throughout the oven for fast, even results. Easily fit a 9” pizza, four slices of bread, or a variety of other snacks and meals. The included rack and bake pan fit perfectly in the toaster oven. Up to 30% more even toasting than BLACK + DECKER conventional toaster ovens. 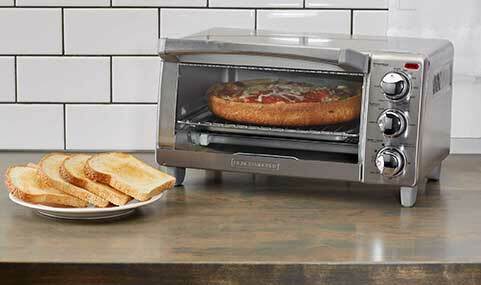 4-Slice Toaster Oven, Stainless Steel with Natural Convection is rated 4.8 out of 5 by 18. Rated 5 out of 5 by stevemz from Great featires This works exactly how I would expect it to. I have taken it to work and use for a lot of foods that I make at lunch. Rated 5 out of 5 by SuzyCute35 from Great countertop device! Perfect for toasting bread and more importantly toaster strudel! The compact design helps limit the counter foot print, and its multi function use is a no brainer. 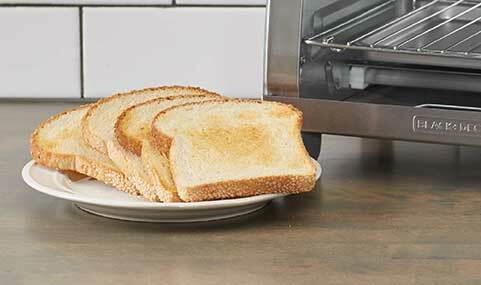 It heats quickly and toasts evenly. Rated 4 out of 5 by SFMamaOf3 from So convenient! We live in a pretty warm climate and turning on the oven to cook for the kids isn't always a great idea. Enter this toaster oven!!! It works great for warming up some quick go-to kid's meals. Chicken nuggets come out warm and crispy and fries never disappoint!! Rated 5 out of 5 by Kyleandrew from Simple to use Simple to use. Seems to be very sturdy and well made. The broil function is very handy for reheating food like pizza etc. The timer function is very handy. Rated 4 out of 5 by Amber29 from Nice, small oven I find this Black and Decker - 4-Slice Toaster Oven to be good for small dishes you want re-heated, or a small meal you want toasted. This is a standard size basic toaster oven in my opinion, but does seem to do its jobn well and cook things properly. This does have analog dials which are very easy to use, but of course may be off by 1-2 minutes, just make sure to turn the dial past 10 and back to set correctly. 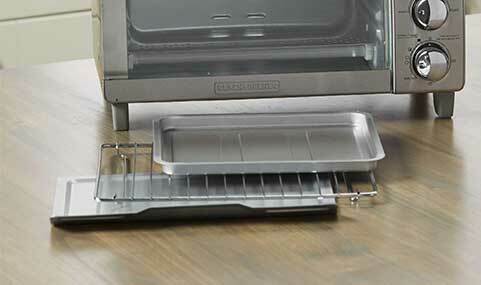 Overall, this works well, does not take up much room, cooks smaller sized foods (great for pizza). What is the difference between the TO 1745ssg, 1755sb, and 1760ss? How did you reviewers get a free one to try out?